The cottages are approached from an even, gravelled courtyard and paved paths to each of the front doors. Parking is available and garden furniture adds to the home from home atmosphere. At the base of the page is a pdf containing further details on the properties and their acccessibility. Granary Cottages 1, 2 and 3 All have oil fired central heating. 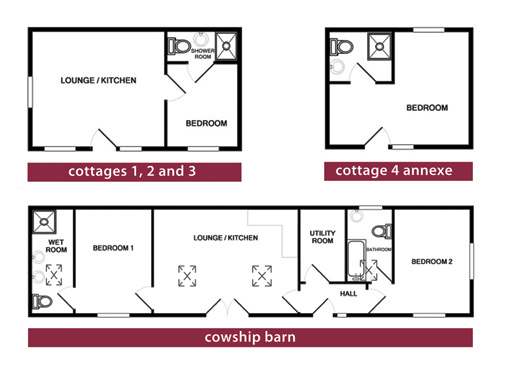 Open plan sitting/dining/kitchen, glazed door & full height window (standard window in Cottage 3). Sitting area has a two seater sofa & TV. Double bedroom with full height window. Shower room. Granary Cottage 4 (annexe) Oil fired central heating. Glazed door to open plan bed/sitting room with window. Sofa, TV and Double Bed. Shower room. A kettle, microwave and toaster are provided for snacks and drink preparation. Cowship Barn Underfloor heating - air to water heat pump. Open plan sitting/dining/kitchen with patio doors, stepping down onto patio. Living room has comfortable seating, TV and log burning stove. Bedroom 1 kingsize bed and ensuite shower (wet room) with twin hand basins - one at lower height for wheelchair users plus a level shower area. Bedroom 2 ziplink superking or twin beds and ensuite bathroom, standard bath with shower over. Utility room with washing machine and sink with drainer.